Snake Valley is a rural township 25 km south-west of Ballarat. In 1857 a major gold rush occurred in the area comprising Carngham and Snake Valley. (Reputedly a miner found snakes in a shaft he was sinking, and this gave rise to the place name). Settlement preceded the rush, however, as a primary school had been opened in 1854. For at least ten years Snake Valley was exclusively a gold mining area. 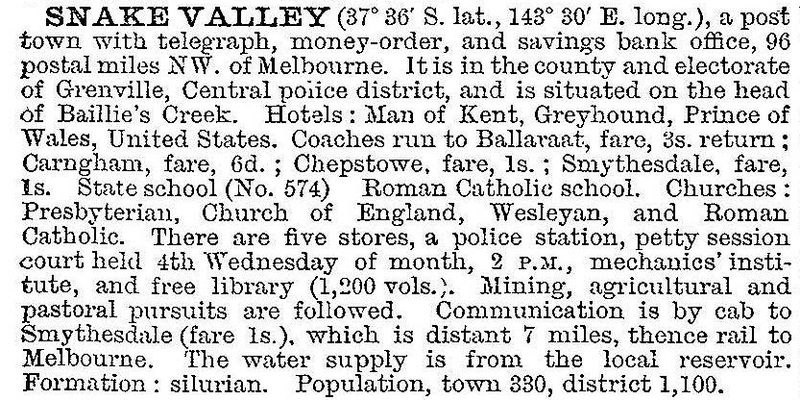 Bailliere’s Victorian gazetteer (1865) recorded Snake Valley as having a court of petty sessions, a mechanics’ institute and five hotels. The surrounding country was described as undulating, moderately timbered and well grassed, which provided the right conditions for farming. There were several creeks to the west, two with permanent water. By the 1880s Snake Valley was described in the Victorian municipal directory as a straggling mining township with outlying farming districts. There were five churches as well as five hotels. The ‘straggling’ character of Snake Valley has persisted, with houses on small allotments and farms extending for about 2 km along the Carngham-Linton Road. The locality has attracted new families, with the population increasing since the 1960s. There has been sufficient patronage for one of the hotels to keep going, and local recreation has been enhanced with a sporting complex (1989) and a branch of the municipal library. Snake Valley has a general store, a school (the Snake Valley campus of Woady Yaloak), a recreation reserve, a golf course, three churches and a mechanics’ institute hall. The former Methodist church is heritage listed and has been used as a scout hall. There is an airstrip east of the town. The Carringum balug clan of the Wathaurong are the traditional land owners of the Snake Valley/Carngham district. A Snake Valley Community Action Plan was formulated in 2002 and has been reviewed and updated in 2011 and 2014-15.